A prominent green party stalwart confided in a businessman buddy his desire to consult a reputed astrologer in a neighboring part of the neighboring country. And the businessman lost no time in arranging for the astrologer to quietly visit the politico’s residence in the city. The astrologer perused the politico’s horoscope and assured him of the presence of a powerful Rajayoga and the appropriate time of its fruitification had had almost arrived. The astrologer left for his hotel suite after advising the politico that it was time for him to aim at the highest position in the country. 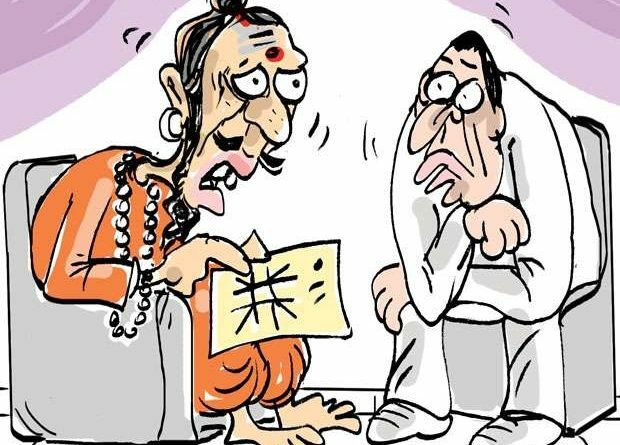 Meanwhile, a confidante of a very high political authority learnt that the well-known astrologer had come to read the horoscope of the green party high-up with a two-letter first name and in a bid to win some brownie points from the high political authority went into action to provide an opportunity for the latter to consult the visiting astrologer. Collecting a hefty fee from the high political authority as well, the astrologer hastily left the country avoiding any more consultations, they say.